With the exception of the filters used for black-and-white photography (see the article Black & White Landscape Photography) the numbers of filters used for capturing color landscapes are few, mostly due to the fact that, in digital imaging, many white balance and filter effects can be addressed in camera. But even with digital capture there are a few tricks you simply cannot apply by clicking among the choices offered by your camera’s set-up menus. If you had to limit yourself to one filter for all your landscape shooting needs, it would have to be a Polarizing filter. Polarizers are unique in that they are among the few filters that cannot be accurately mimicked electronically. Electronic Polarizing filters are pretty good at emulating the saturated colors you get from Polarizing filters, but they cannot reduce or eliminate glare and reflections the way glass Polarizers do, and that’s the key application of Polarizers. Rather than pumping up the color saturation levels, Polarizing filters intensify the color of an image by eliminating stray light and reflective glare, which in turn makes it possible to capture better highlight details, make clouds pop from dark, blue skies, and allow you to see the stones resting under the sparkling surface of the river. For best results, Polarizers should be used when the sun is behind you, preferably about 30° off your left or right shoulder. Polarizers are available in linear or circular configurations, which while identical in appearance and functionality, are optimized for manual (linear) and autofocus (circular) lenses. In practice you can use circular Polarizers on both AF and MF lenses, but linear Polarizers can sometimes confuse your camera’s autofocus and metering systems, so use them with caution. One of the down sides of Polarizers is that you lose two to three stops of light, depending on the degree of Polarization you dial in, although this can come in handy if your goal is to also shoot at wide apertures or blur the movement of people or flowing water. Polarizing filters are also available with extra UV Haze-2A coatings, skylight coatings, warm-tone coatings, as well as enhancement and intensifying coatings, which pump up the red/orange/brown saturation levels more than a standard Polarizing filter. When using enhanced or warm-toned Polarizing filters it’s important to set your White Balance to Sunny or to a Custom WB setting, and by all means avoid Auto WB, which invariably diminishes or eliminates entirely the warm tones and enhanced colors these filters are designed to produce. Keep in mind that when they’re used on lenses with fields of view wider than approximately 90°, Polarizing filters can sometimes render blue skies unevenly. This effect is most likely to occur when using lenses wider than 24mm on a full-frame camera, 16mm on APS-C format cameras, 12mm on Four Thirds cameras and 35mm on medium-format cameras. If you’ve ever shot stills or video at the beach or on snow-covered landscapes, you’re quite aware how difficult, if not impossible it is to shoot at wide f-stops, and this is where neutral density (ND) filters come into play. As the name implies, neutral density filters are colorless filters that reduce the amount of light passing through your lens in 1/3rd and full-stop increments, making it possible to shoot stills and video at wider lens openings without affecting the shutter speed or color-rendition of the image. Along with a greater range of lens-aperture control, ND filters also make it possible to blur motion in still images well beyond the two to three-stop ranges of Polarizing filters. Variable ND filters are also available, which enable you to dial down the volume of light passing through your lens by a factor of 1.3x to 10x by simply rotating the filter flange as you would a Polarizing filter. Variable ND filters enable you to respond quickly to changing lighting conditions on the fly without having to stop the show in order to swap filters. Graduated ND filters are a third type of ND filter. Available as screw-in or square/rectangular drop-in filters, graduated ND filters are clear on one end and gradually build up to 1/3rd to three full stops of neutral density on the opposite end. Graduated ND filters make it possible to balance out uneven lighting conditions such as multi-story atriums lit by skylights or sunlit mountains with valleys deep in shadow. 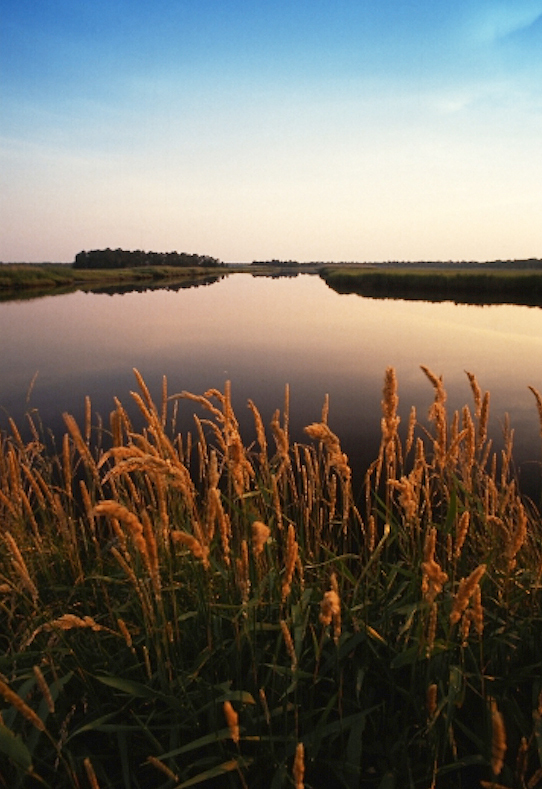 Graduated ND filters can also be used to darken skies or foregrounds in landscapes. 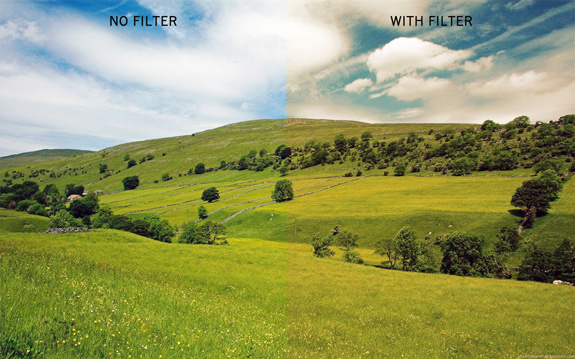 Graduated filters are also available in color tints. Generally, drop-in graduated filters are preferable to screw-in graduated filters, since they allow for greater control of where in the frame the darker portion of the filter falls within the image. Ideal for landscape applications, enhancing filters (Tiffen, Lee), also marketed as intensifying filters (Singh-Ray), are made from a rare-earth element (Didymium) that reduces a narrow range within the orange portion of the spectrum, resulting in moderate increases of saturation in rust-brown, orange and red-toned subjects and greater levels of saturation in crimson and scarlet-colored subjects. These unique characteristics make enhancing filters ideal for landscape applications, especially when shooting foliage, rock formations, wood structures and similar color-centric scenarios. When using enhancing or intensifying filters it’s recommended you avoid Auto WB as its nature is to neutralize the color balance of the photo. Instead, use a pre-set WB (Sunny, Cloudy, etc. or custom unfiltered) balance in order to realize optimal results. Enhancing filters are not recommended for portraits as they tend to exaggerate warm tones, and as such, do not enhance your portrait subjects. Though most often used for protecting the front element of your lens, UV filters, especially the heavier-coated UV-2A, 2B, 2C, 2E filters, help to reduce ambient UV light, which permeates the midday atmosphere and reduces image detail, especially in the warmer months. In order to maintain optimal image sharpness and dampen the cold harshness of summer midday light, both Singh-Ray and Tiffen produce a series of Warm UV and Warm UV-17 filters, the latter of which is a Warm UV combined with an 81-2 warming filter to further reduce atmospheric haze and the excess levels of blue coloration common to landscape imagery during the warmer months. As with all filters designed to selectively or globally alter the color rendition of the photograph, avoid using Auto WB settings when shooting with warm-toned UV filters. 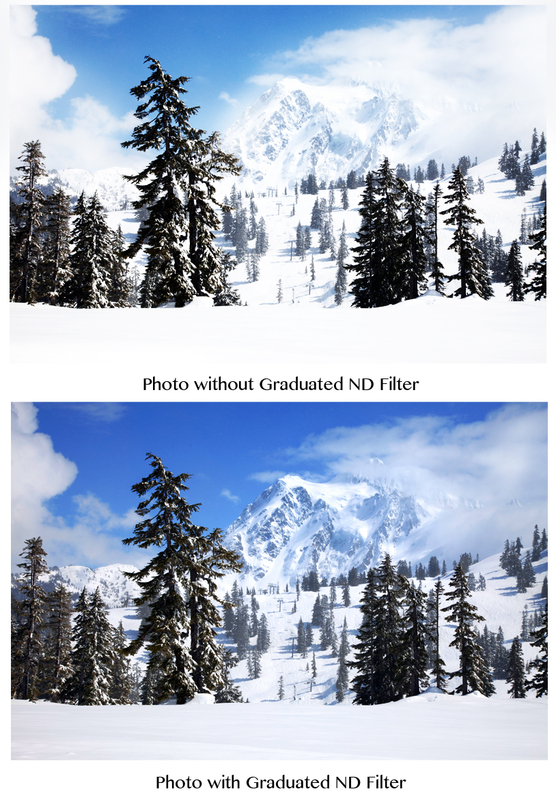 Graduated filters can be incorporated into your workflow, as you shoot, or post-capture using electronic filtration kits. Available as neutral density (ND) grads or color grads, graduated filters allow you to balance the exposure levels of photographs in which the top or bottom of the frame have differing exposure values. ND grads are available in a number of densities ranging from 0.3x to 9x (1/3rd stop to 3 stops). Color grads are available in similar gradations, but with color tints instead of colorless neutral densities. And in case you’re curious, according to the listings on our website, B&H carries close to 60 different varieties of color graduated filters. Depending on the filter, grads are available with soft-edge blend lines and hard-edge blend lines. Because grad filters are clear on one end and gradually build up color or density toward the opposite end, they can be used in interesting combinations by placing them in front of the lens in opposing directions. When using color graduated filters, you should stick to pre-set WB settings (Sunny, Cloudy, etc.) and avoid Auto WB, as it will inherently try to neutralize any color filtration you place in front of the lens. Though it’s preferable to shoot landscapes during the earlier and later portions of the day when the light is warmer, shadows longer, and contrast levels less drastic, there are times when there’s little or no choice other than midday when the light can be harsh and blue (sometimes called "cold"), especially during the longer days of summer. For times such as these it’s a good idea to warm the scene with 81-series warming filters, which are available in varying increments ranging from mild to strong: 81, 81A, 81B, 81C, 81D, 81EF, 81Z, 81-One, and 81-Two. Warmer yet are the 85-series filters: 85, 85A, 85B and 85C filters, which have a stronger orange presence than the more subtle amber tones of 81-series filters. As with color graduated, enhancing and other filters containing coloration, you should avoid Auto WB and stick to pre-sets (Sunny, Cloudy, etc.) or custom WB when using warming filters. Depending on the time of day and weather conditions, contrast levels can often be too high or too low. 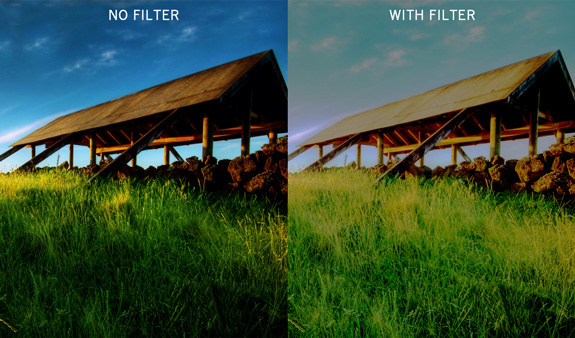 To remedy contrast issues, we stock a number of filters that enable you to tweak contrast levels back to aesthetically agreeable levels. 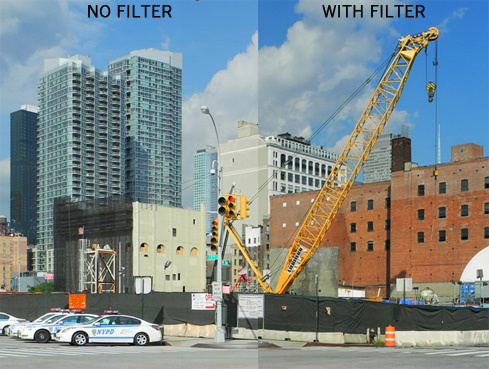 Contrast-reducing filters include Fog filters, which emulate the look of a fine, atomized drizzle and Pro-Mist filters, which reduce contrast by giving a halo-like flare effect to highlight areas. Similar to Pro-Mist filters are Black Pro-Mist filters, which achieve the same effect, albeit with less contrast loss to the black areas of the frame than with the more global diffusion afforded by standard Pro-Mist filters. Another filter choice, and one that reduces contrast with little if any halo or image softening effect, in the least obvious manner, is Tiffen Ultra Contrast filters. The last groups of filters we’ll discuss are #87 and #89 filters, which are used for infrared (IR) imaging. Nearly opaque, these filters are designed to block virtually all visible light, allowing only infrared radiation to strike the film or imaging sensor. 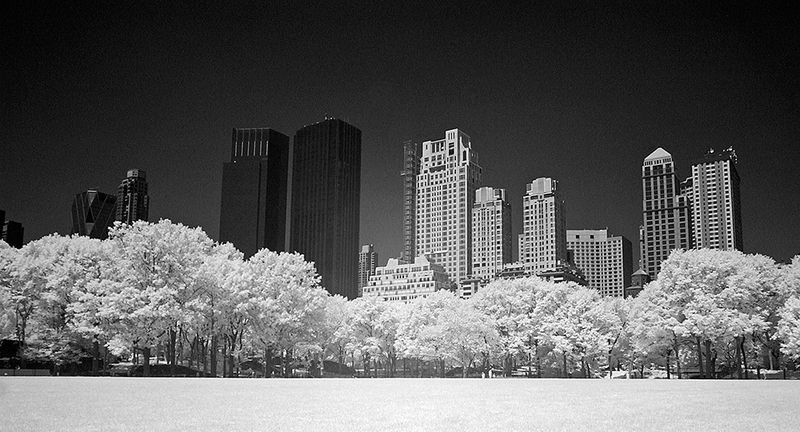 In the days of film, IR photography was tricky, to say the least. In digital imaging—and specifically LCD screens that display the image within a moment or two after being captured—IR imaging has gained an appreciable following. IR landscapes can prove to be quite unique in the way they render skies black, foliage white, and other “colors” any number of interesting ways, depending on how much infrared radiation those colors and shades emit. Filters can vastly improve an image, and in some cases save images that might otherwise be too flat, too contrasty, too blue, or too warm for your taste. Although many of the filters mentioned above can fix questionable imagery, it’s always a good idea to proceed with a light foot on the pedal when adding filters, because the line between “just right” and “maybe it’s a bit too much” is usually a very fine one, so take a moderate approach when applying filtration to your photographs. We’d love to hear from you. If you have any questions or suggestions, please submit them to the Comments section below. The landscaping that you guys have in the US is breath taking. all sow helps macks the photography speeck to one. I can ionly dream of being able to caption such buty where I am livoing in SA. Good luck 4 the fucher. I'm just becoming interested in filter use and my question is; even if I'm shooting in RAW, using a filter (e.g. warming filter) I should avoid using AWB? In general, I tend to avoid auto white balance in favor of doing a custom white balance. If its worth taking the time for your shot to add fitlers and make the trip, take an extra minute or two and do the custom white balance. Ultimately you'll have the most accurate color capture, even when using warming filters or polarizers etc. EFS 18 to 135 mm lens. I would like a very good quality filter. Hitech Grad ND filters are part clear, part neutral density (available in grades of .3 (1 stop), .6 (2 stops), .9 (3 stops), 1.2 (4 stops)). They allow the transition to be blended into the scene, often imperceptibly. A neutral density .6-to-clear, with a two stop differential, will generally compensate the average bright sky-to-foreground situation and is also the most popular density of the series.